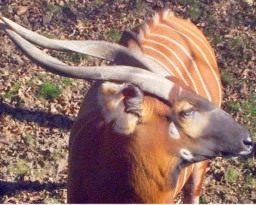 The Ankasa Conservation Area lies in Southwest Ghana on the border with the Ivory Coast. Covering 509km2, this Protected Area falls within an ancient rainforest and is the most biodiverse in Ghana. It represents the only wet evergreen protected area in almost unspoiled state. 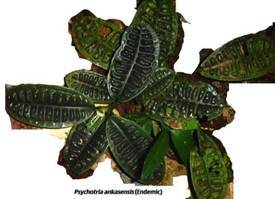 It is home to over 800 plant species, including some endemic ones like the recently discovered Psychotria. 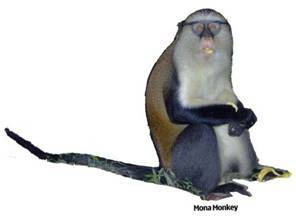 or endangered subspecies endemic to Côte d’Ivoire and Ghana: Roloway Diana Monkey, Geoffroy’s Pied Colobus and White-naped Sooty Mangabey. The area has an impressive bird list of over 200 species, the majority of these being truly forest dependant. Several rare birds endemic to the Upper Guinea Forest, e.g. White-breasted Guinea Fowl Agelastes meleagrides, Yellow-throated Olive Greenbul and Rufous-winged Illadopsis are found in the area. The extensive network of smaller streams, together with the 3 main rivers of the Protected Area similarly supports a variety of reptiles including the Broad-fronted Crocodile. Over 600 butterfly species with many endemic species have been recorded, and the network of streams in the area is an important breeding ground for many of the fish species in the region as well as being of an important watershed for the rivers west and south of the Protected Area With many yet-to-be discovered plants and animal species, Ankasa offers a virgin laboratory for scientists and students. Its quiet milieu is equally conducive for religious and recreational tourism. The entrance road to the park is located at Sowodadzem, 120 km from Takoradi 22 km from Elubo along the Takoradi-Elubo section of the Ghana-Côte d’Ivoire International highway. Visitors have various options to get to the park, from using private vehicles, public transport (locally called “tro-tro”) or taxis. There are plans to station bicycles at Sowodadzem (6km from the park entrance) for backpackers. The visitor information centre is located some 100 metres from the main gate. Staff are in place to provide necessary information to visitors. Although over 10km of the park is motorable, it is best enjoyed through guided walks. Five tourist trails enable the visitors to feel the rain forest. Although forest animals are difficult to see (because of the closed vegetation), visitors can hear calls from many species, especially monkeys who can sometimes be seen jumping from tree to tree in the canopy. 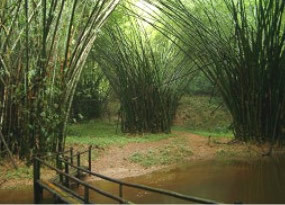 The spectacular Bamboo Cathedral is located at Nkwanta about 8km from the Ankasa gate of the Park. Though not a church building and has no human Bishop, a priest nor a creed, the site showcases nature’s perfect architectural design. The Bamboo Cathedral has become a very popular site for visitors. This site offers a quite environment for visitors. 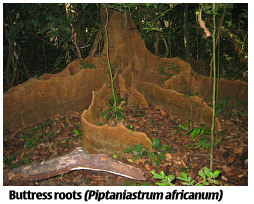 The Ankasa rainforest serves as shed for many streams and rivers. Three of them from which the forest derives its name are the Ankasa, Nini and Suhien. The fascinating characteristics of these rivers are the rapids found on them. The breezes along the rivers and rattling noise of the rapids are a delight to tourists. The potential for canoeing is being explored. 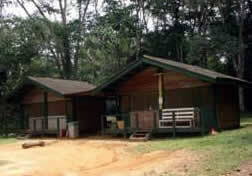 Four tourist chalets (with 2 beds each) are located at the heart of the park. Basic cooking facilities are provided but visitors need to bring their own food. Other facilities include portable water, shower, toilet, and solar powered electricity. Large groups of up to 34 people can make special arrangement to be lodged at the Ankasa Exploration Base with facilities similar to those at the Tourist Chalets. It is hoped that more accommodation may become available if a private investor can be found for a concession agreement to build a lodge. Visitors can also chose to stay at Frenchman Home Stay just about a kilometre from the park or chose any of the following hotels and beach resorts located along the West Coast and only a 1 to 2 hours drive from the park: King James Hotel and Osamidi Hotel in Elubo offering basic accommodation and restaurant; better services are offered at Beyin Beach Resort in Beyin (Amansuri Wetland); Ankobra Beach Resort, Axim Beach Resort and Lou Moon, all around Axim; Busua Beach Resort, Tess’s Hideout, Fanta’s Folly and Ghana Spirit at Butre, Green Turtle Lodge and Safari Lodge around Cape Three Points and Miemia. Entrance fees in the table that follows vary depending on the nationality, age, duration of stay and means of locomotion. If in doubt please contact the park for details.